There is a Birkin bag made of crocodile and diamonds headed for auction right now and you can buy it, for the low, low price of $200,000 or an ivy league education in America. Who doesn’t have that kind of cash lying around, you know? According to the Daily Mail, experts say that this Hermès bag, named after actress Jane Birkin, is “one of the most spectacular one ever made by the Parisian fashion house.” All of the purse’s fitting are made of 18-carat white gold, it’s encrusted with 245 diamonds and is made of Matte Himalayan Nilo Crocodile skin. Even Kim Kardashian and Victoria Beckham don't have this purse. Heritage Auctions, who set the world record for crazy expensive bag sales back in 2011 when they sold a red Hermès Birkin for about $200,000, will be handling the sale. But Kathleen Guzman, managing director at Heritage Auctions, is pretty sure her company can squeeze out more than $200,000 from their buyers this time around. 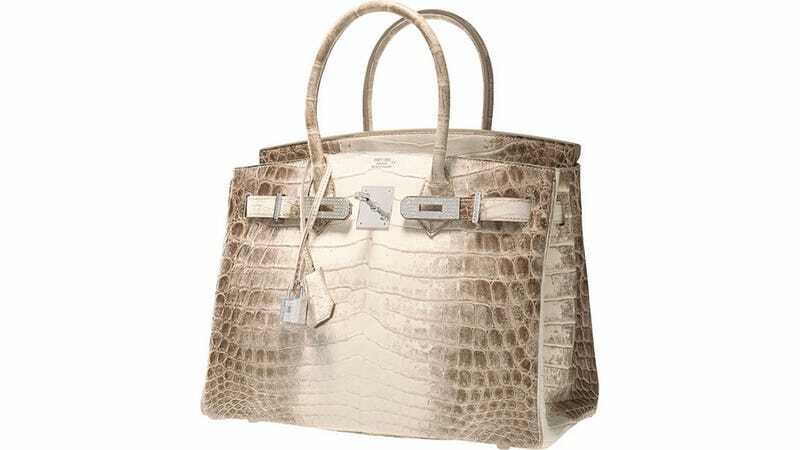 "A 30cm Diamond Himalayan Birkin is possibly the rarest and most desirable handbag in the world," she said. "This bag is so rare and sought-after that there's a very good chance it could meet or exceed the world record price we saw three years ago. This is the only time that a bag of this calibre has appeared on the luxury re-sale market. This is a dream piece for the collection of true Hermes aficionados." You can watch someone else buy this bag on September 23 in Beverly Hills, California — if you dare.